Some of the glassware created by Erin Dickson and used by SAFC supporters at the Colliery Tavern pub. Sunderland's National Glass Centre is celebrating its 21st birthday by showcasing the work of more than 60 artists who have helped develop the city’s reputation for excellence in glass. The featured artists have helped develop glass making in Sunderland both before and after NGC opened to the public on June 20, 1998. The exhibition of their work, NGC 21, tells the story of the city’s role in the growth of the International Studio Glass movement. It includes work by founders and innovators including Erwin Eisch from Germany and Stanislav Libenský and Jaroslava Brychtová from the Czech Republic, alongside the work by outstanding graduates of the University of Sunderland including Erin Dickson and Jade Tapson. “The exhibition includes pieces by more individual artists than any other presented at National Glass Centre in recent times and we are proud to say we have worked with enough creative glassmakers of international calibre over the last 21 years to be able to fill our gallery spaces twice over,” said Julia Stephenson, NGC’s Head of Arts. A key piece of work in the NGC 21 exhibition is a 2.5m-wide mirrored ‘portrait’ of National Glass Centre, created by Jeffrey Sarmiento, Associate Professor at University of Sunderland. Black Cat created by Erin Dickson. Aerial drone footage of the centre’s glass-topped roof was used as a template for the wall-mounted design, which was then created in the studio using a waterjet cutter to shape its multiple components. “The artist hopes the audience will be able to see themselves reflected in the work as part of the community which makes National Glass Centre such a local landmark,” explained Julia. 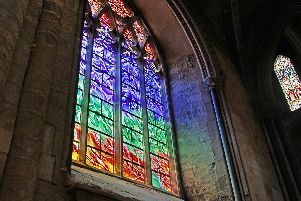 Sunderland’s connection with glass making dates to the seventh century, when Benedict Biscop brought glaziers from Gaul to make the first known stained-glass window in the country for St Peter’s monastery in Monkwearmouth. By the 20th century glass making was an important industry for Sunderland through companies including Hartley Wood and Co Ltd and James A Jobling & Co. Ltd., who made Pyrex glass. This heritage has inspired one of the newly-commissioned pieces which brings the exhibition up to date. Erin Dickson, who completed her PhD at University of Sunderland in 2015, has revived local glass history with her New Jobling Ware inspired by the designs of the company and Sunderland Association Football Club. To celebrate her new work, Erin took a set of her glasses to the Colliery Tavern pub, opposite the Stadium of Light, to allow SAFC fans to toast the ‘Black Cats’ with a unique piece of art. The NGC 21 exhibition is open every day from 10am to 5pm until Sunday, 15 September. Other activitoes planned to coincide with the 21st anniversary of the NGC opening to the public on June 21 includes a family open day on Sunday, June 23, from 10am to 5pm; a People’s Pyrex exhibition at Arts Centre Washington, which opens on June 21 and a new glass exhibition about Sunderland’s glass heritage which will open at Sunderland Museum and Winter Gardens in July. Stuart Akroyd; Galia Amsel; Conrad Atkinson; Kirsteen Aubrey; Emma Baker; Sarah Blood; Sara Bowler; Charles Bray; Effie Burns; Dillon Clarke; Tessa Clegg; Vanessa Cutler; Mike Davis; Jamex and Einar De La Torre; Erin Dickson; Matt Durran; Erwin Eisch; Alec Finlay; Ray Flavell; Catherine Forsyth; Stefan Gec; Morag Gordon; Jiri Harcuba; Colin Hawkins; Vicky Higginson; Kathryn Hodgkinson; Katherine Huskie; Laura Johnston; Bridget Jones; Jessamy Kelly; Silvia Levenson; Stanislav Libenský and Jaroslava Brychtová; Julia Linstead; James Maskrey; Alena Matějka; Bruce McLean; Charlie Meaker; Joanne Mitchell; Lukas Mjartan; Helen Pailing; Zora Palová; Inge Panneels; Yi Peng; Kevin Petrie; Colin Rennie; Bruno Romanelli; Jeffrey Sarmiento; Bibi Smit; Petr Stanický; Jade Tapson; Angela Thwaites; Oiva Toikka; Roger Tye; Bertil Vallien; Sylvie Vandenhoucke; Göran Wärff; Cate Watkinson; Wearside Glass (Brian Jones and Norman Veitch); Richard Wheater; Kathryn Wightman; Emma Woffenden; Ann Wolff and Cerith Wyn Evans.